Christodora 2017 Autumn Gala featured on Questmag! With Christodora’s annual Campfire Autumn Gala Dinner coming up in November, I sat with Eva Pomice—an active member of the charity’s board—who provided insight into the extraordinary organization. Q: Tell me about the goals of Christodora. A: Christodora provides over 3,000 New York City students with experiences in nature and environmental education on a year-round basis. 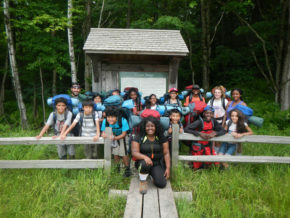 We have camp at Manice, our Berkshires wilderness program; afterschool and weekend conservation programs in the city; and a hands-on ecology curriculum taught by our educators in public school classrooms. Q: How does Christodora differ from other organizations with similar missions? A: Christodora has an explicit focus on building life skills through wilderness immersion. We work with young New Yorkers from underserved backgrounds from middle school through college—half our staff is made up of alumni. Campers hike and canoe, but also learn about forest ecosystems, animal behavior, and practice organic gardening. Leadership and team-building exercises are tied into activities like navigating a night hike, forging an incredibly close community. Students have gone on to become scientists and educators, and, needless to say, fierce protectors of the environment. Q: What is the history of the organization? A: Christodora was founded in 1897 as a pioneering settlement house on the Lower East Side serving low-income New Yorkers, mostly new immigrants. Q: What is your role in the organization and why did you choose to become involved? A: I’ve been on the board for more than a decade, co-chaired the Campfire Dinner, and served on various committees. I was drawn by the fact that it’s a small organization with a big impact, and there are many opportunities to work directly with students. Q: Who are the other key players? A: Tania Pouschine, longstanding board chair and treasurer; Pamela Manice, president; Judith Rivkin, executive director; and Matthew Scholl, program director, are all extraordinarily dedicated. Q: I know the Campfire Dinner is the organization’s biggest fundraising event. I’d love to hear more about it. A: Christodora Campfire, our autumn gala dinner and auction, is held in November at the University Club. It’s an elegant, fun evening and, as with any campfire, the highlight is the storytelling. This year our honorees include two women who started our camp in middle school and became hooked, eventually becoming outdoor educators. One is now an accomplished geoscientist and the other is the chief sustainability officer for the city of Newark, New Jersey. Year after year, these stories show how lessons learned in nature change lives in the city. For more information on Christodora and to buy tickets to the Campfire Dinner at the University Club, visit christodora.org. To purchase tickets for the 2017 Christodora Campfire Gala, click HERE! TICKETS TO TV SHOWS, TICKETS TO BROADWAY SHOWS AND MORE!!! AT ACCUWEATHER IN STATE COLLEGE PA.
FALLS VILLAGE — The first thing the 14 New York City high school students had to do on arriving at the Yale Forestry camp in Great Mountain Forest (GMF) was surrender their cell phones. Two weeks later, they all had survived. Judith Rivkin, Executive Director of Christodora Foundation in New York City, was on hand Thursday, July 21, for the last day of camp and the presentation of research projects — not to mention the return of the phones. 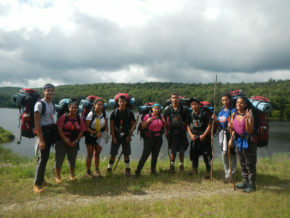 The foundation helps urban high school students build leadership and academic skills through environmental education. The Summer Ecology Program allows students to explore forest ecosystems and requires them to conduct original field research. Rivkin described the program as a “youth program through nature and science.” She explained that the students, 16 and 17 years old, are from New York City. For most, it was their first experience in the woods. Rivkin added that the teenagers did not exhibit cell-phone withdrawal symptoms. The students began their two-week stay by hiking around GMF with forest manager Jody Bronson and his staff, observing things. Then, after breaking up into small groups, the students brainstormed dozens of ideas for research projects. Jennifer Dahlstrom, who is the chairman of the science department at the Institute for Collaborative Education in New York, said the teams had to work through their brainstorming results and come up with experiments that could be accomplished over the two weeks and with limited resources. The students did take a trip to the Norfolk Library to do some research. But the bulk of the work was done on-site. Dahlstrom said the process “showed a good science background” on the part of the students. The students were assisted by Christodora alumni. Tavion Williams of Brooklyn was the outdoor education coordinator. Adrian Castro from the Bronx has been involved with Christodora since age 12 and is now working on a Ph.D. at Rensselaer Polytechnic Institute. One team, the Black Bears, boiled their observations down to the question of how terrain and elevation affect plant growth. They then refined the concept further, to calculating the effects of elevation on concentrations of nitrogen, phosphorus, potassium and water. The Black Bears took soil samples at elevations ranging from 1,400 to 1,700 feet and used a soil testing kit. To determine water concentrations, the group put the soil in an oven and waited for the water to evaporate. that their experiment was not perfect. They suggested ways the procedure could be improved — including collecting samples in one day to prevent varying weather from affecting the data. For example, rain could wash away nutrients, increase water concentrations and change pH. The group also decided that they should have taken into account the fauna near the samples, because animals can change the soil around them. The group Girls Who Rock studied insect diversity in varying locations. They found an uprooted, but not completely downed, eastern hemlock. They wanted to determine whether or not the tree provides a better microhabitat than the area surrounding it. The group collected 40 insects, both ground and flying species, from near the tree and from the surrounding area. To ensure that their data were unbiased, they threw a glove in the air and put a trap where it fell. They found that, on average, there were more insects near the uprooted hemlock than in the surrounding area. The group determined that dead trees are beneficial to the environment and provide valuable habitat not only for insects but also for other animals, such as bears (they found evidence that a bear had been staying in the area where the roots of the tree had formed a sort of wall). One of the Girls Who Rock, Deasia Ratcliff, 16 and from the Bronx, has been in the program since the sixth grade. She said the program “isn’t all work, so it’s more fun.” Deasia used the difference between her urban background and the decidedly rustic GMF setting to good effect during the group’s explanation of how to trap insects for study. “It’s just like the traps you use if you have roaches in your house,” she said. “I’m just saying,” she added in response to the laughter.